Staples is now a provider of offices, not just supplies. Staples (SPLS is testing a venture that could help it draw interest and traffic to its diminishing office supplies stores. In September, Staples partnered with Massachusetts operator of co-working space Workbar, to bring offices, reservable conference rooms, private phone rooms and free onsite parking, plus unlimited coffee as the retailer pointed out, to monthly members at a cost of $130. The spaces are only available at three Staples stores located near Boston so far. A Staples spokeswoman declined to comment on future endeavors. The membership provides users with two hours of reservable room usage and two days use of 15 other Workbar spaces in Massachusetts. For an additional $100 a month, members receive 10 hours of reservable room usage, an extra $40 gets members mail service and another $40 provides locker space, according to Staples. Corali Lopez-Castro, partner at Kozyak Tropin & Throckmorton's bankruptcy and commercial litigation practice group, said the move is likely a ploy by Staples to gain foot traffic, as strategically the Workbar spaces are located in the back of the stores, forcing members to walk down the aisles of pens and notebooks before arriving at their destination. "It's the same reason milk is placed at the back of supermarkets," Lopez-Castro said. "You have to walk through the whole supermarket before [reaching the common food item]." 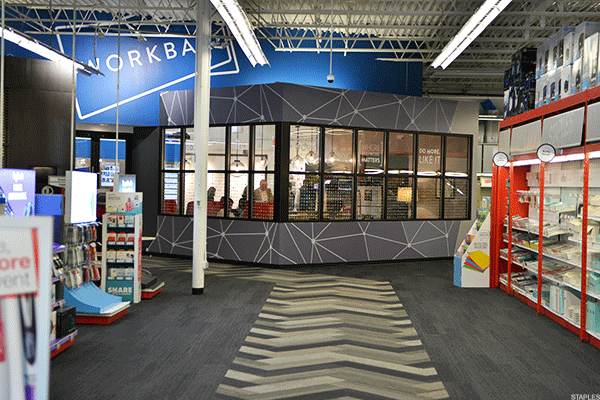 A Workbar room in Staples. The move comes amid years of slowing sales at Staples. Like many retailers, the company is planning for massive store closures this year. Last year, Staples shuttered 48 stores in North America and plans to close an additional 70 this year after facing another weak year. Staples's revenue slipped 3% to $18.2 billion in 2016, missing Wall Street's estimates for $20.25 billion, while comparable store sales fell 1%. "Retailers are getting battered in this marketplace and it calls for creative solutions," Lopez-Castro said, likening Staples' venture to athletic apparel retailer Nike (NKE - Get Report) opening a basketball court in its 55,000-square-foot New York City store and fashion discounter Urban Outfitters (URBN - Get Report) purchasing pizzerias in cities including Philadelphia and New York. It's about "creating an experience," a "plan B," in case their retail stores go down the tubes, she said. Editor's Pick: Originally published March 31.